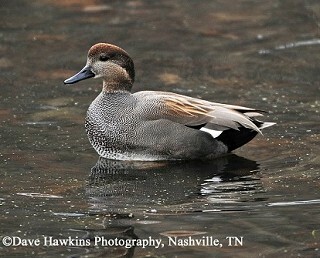 Gadwall are commonly found in Tennessee during the non-breeding season in mixed flocks with other waterfowl. These birds are dabbling ducks, which means they forage by tipping their hind end up in the air to reach aquatic vegetation, seeds and snails below the surface. They breed from southeastern Alaska to the Great Lakes, south to Texas and California. In winter, they migrate to the southern United States and coastal Mexico, with the largest concentrations along the Gulf Coasts of Louisiana and Texas. In Tennessee, they generally arrive by mid-September and depart by mid-April. Description: The male is overall gray, with a paler head, and a black hind-end. The female is mottled brown. In flight, both male and female have a white belly, and a small square white patch in the wing. Voice: The female has a quack similar to a Mallard; the most common vocalization of the male is a nasal burp. No other dabbling duck has a similar square white wing-patch. All other dabbling ducks with a black hind end also have a white patch just in front of the black. Habitat: In Tennessee they are found on ponds, lakes, rivers and forested wetlands. Diet: Submerged aquatic vegetation, seeds, and aquatic invertebrates. 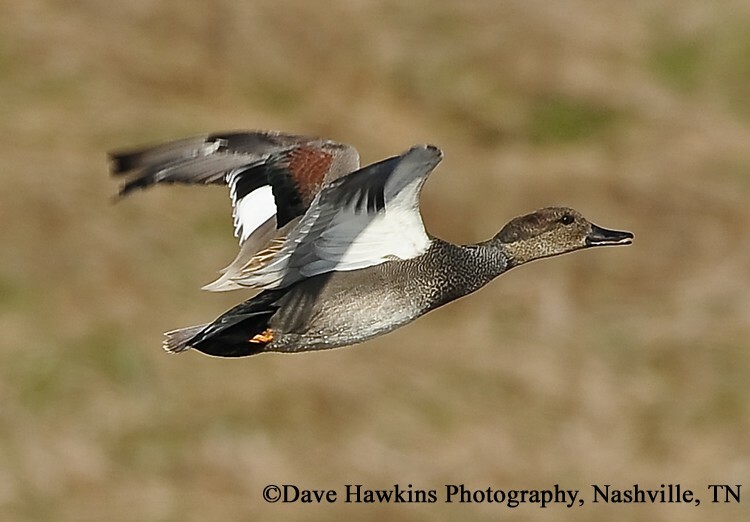 Nesting and reproduction: The Gadwall has never been known to nest in Tennessee. Status in Tennessee: Gadwall are fairly common migrants and winter residents across the state, but are more common in Middle and West Tennessee. They arrive by mid-September and depart by mid-April. Habitat degradation and drought conditions from the 1960s through the early 1980s caused many waterfowl populations in North America to decline. Improved wetland conditions in the Great Plains region and Prairie Provinces of Canada from 1986 to 1996 resulted in an increase of 129% in Gadwall numbers. The oldest known Gadwall in the wild was 19 years, 6 months old. Best places to see in Tennessee: Ponds, lakes and forested wetlands across the state, including most National Wildlife Refuges. LeSchack, C. R., S. K. McKnight, and G. R. Hepp. 1997. Gadwall (Anas strepera). The Birds of North America, No. 283 (A. Poole and F. Gill, eds.). The Academy of Natural Sciences, Philadelphia, PA, and The American Ornithologists' Union, Washington, D.C.